Image: Russia - Flag Raised, a symbolic moment for the good people of Russia; it's their "The Evil Empire is dead, long live Mother Russia" moment giving life to the myth and providing an invaluable public relations image for the people to cling to. 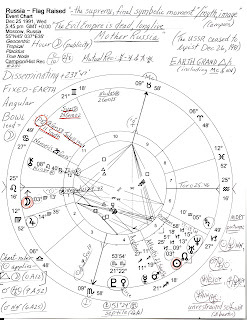 The chart is set for a Lunar Hour on December 25, 1991 5:45 pm GMT Moscow, Russia; it is two years until the series of Great Conjunctions between 'new world order' planets of The Enlightenment, Uranus and Neptune (1993) though they are conjunct in this chart, as you see. In Nicholas Campion's The Book of World Horoscopes, the Flag Raised chart is #280, and is one of twenty horoscopes shown for the country now called, Russia. The book's Russia charts range from the Russia Unification chart of September 20, 0862 (Novgorod) through the Bolshevik era (1917), past the end of the USSR and Russian independence, and on to the Flag Raised chart you see here. 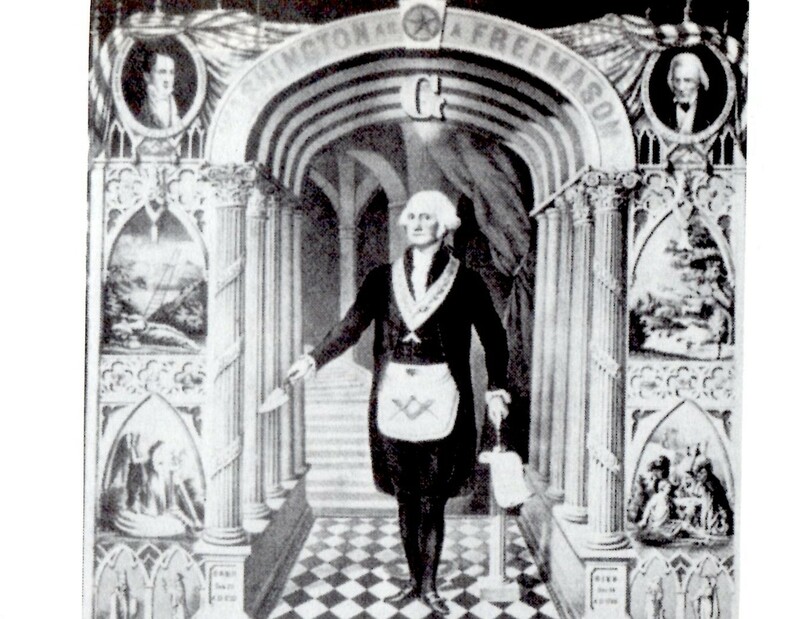 Since this horoscope times a symbolic act to support a favorable image for the Russian public to admire, and since approval-seeking Mr. Trump is all about public image along with his love of money and gold, it is here displayed because the chart seems to resonate quite well with Trump's natal planets including his natal Ascendant (29Leo) with Mars rising @26Leo (conjunct this chart's Ascendant) and carrying royal star Regulus with them. 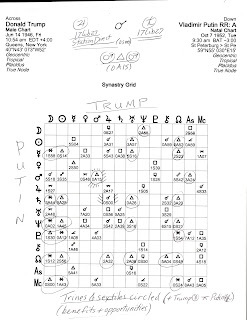 And note that in the Synastry Grid shown below, the two men enjoy a working relationship via a close Mars-Mars trine (0A15), plus, Putin's natal Saturn @17Lib27 precisely conjoins Trump's natal Jupiter @17Lib27 (strong in its Station Direct condition). 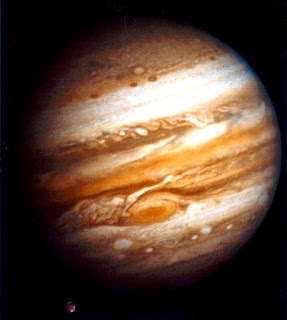 To me their Saturn-Jupiter combo supports what some in the US intelligence community have said--that former KGB agent Putin has cultivated Trump as a Russian asset for years and we know the Trump organization has received funding from Russia in the past, or so said Donald Trump, Jr who was born under this chart's Sun Cap-Moon Virgo personality blend. Sympatico? If so, financial arrangements between Putin/Russia and Donald Trump compromised Trump the candidate and made him unfit to play the role of US president--and that's besides Russian interference in our 2016 election/s which may have also benefited certain Republican politicians (and possibly Dems) who don't want "Russia-Gate" investigated for self-protective and political reasons. Mr. Trump's often expressed approval of Mr. Putin's way of doing things has hinted at his compromised condition ever since--and now the two seem to be phone pals (as long as Putin continues to flatter Trump). 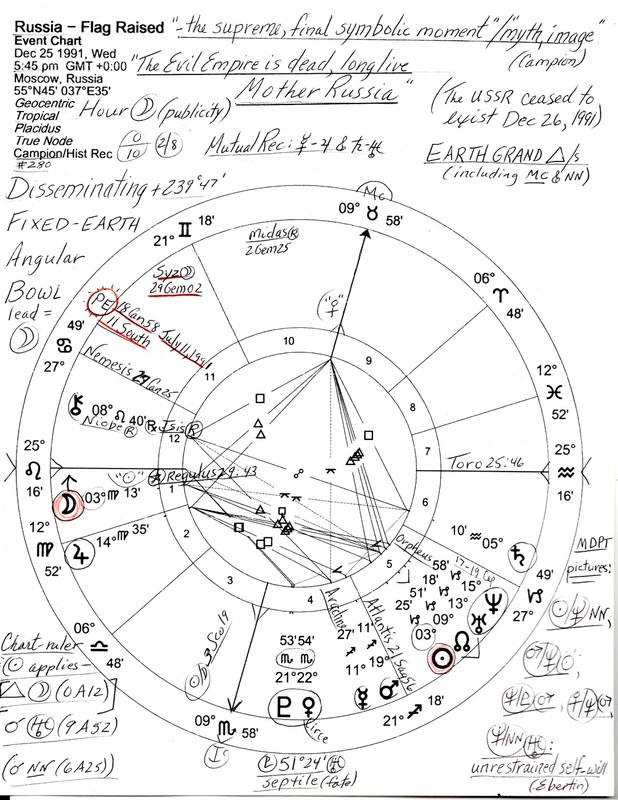 And if we compare this Flag Raised chart of Russia with the natal horoscope of Donald Trump we see, among other connections, an interesting double Moon-Mars link between them. In Politics and Business, Michael Munkasey's Midpoints: Unleashing the Power of the Planets gives a description of this planetary pair as: 'leaders who show concern about the welfare of others, but who don't necessarily follow through with relief','using or developing metal or mineral resources', 'farming activities which do not receive sufficient support from leadership', 'a military hierarchy which fluctuates in its effectiveness', and/or 'commercial uses of land resources for military or business activities'. 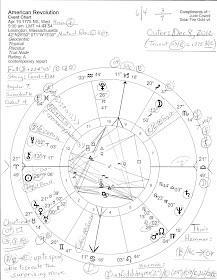 So considering dictator-wanna-be Trump's apparent adoration of dictator Vladimir Putin, is it a cosmic curiosity that Mr. Trump's Secondary Progressed (SP) New Moon which perfects on September 16, 2019 @3Vir00 conjoins the rising Moon of Russia (in this chart)? Not to me it isn't. How about you? 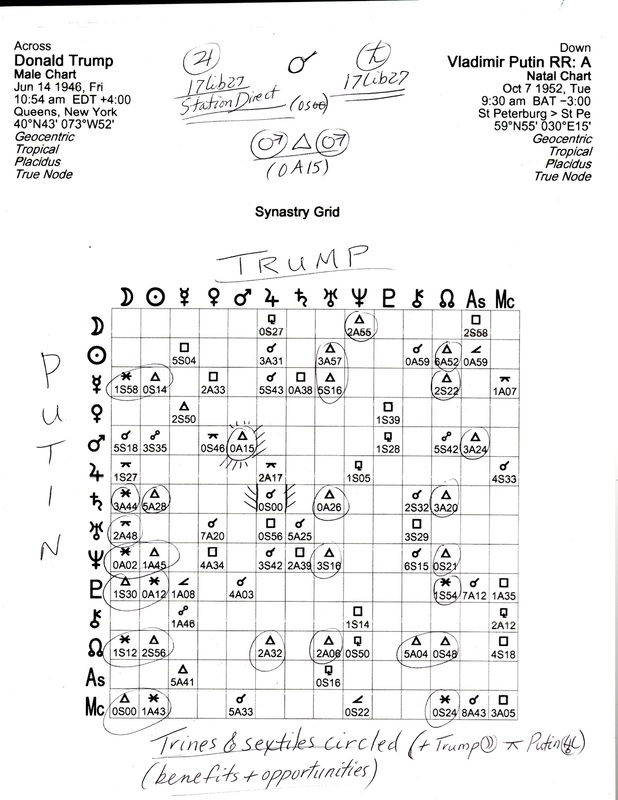 Synastry Grid: Trump (across) and Putin (down); trines of benefit and sextiles of opportunity are circled (as is their Moon-Uranus quincunx by mistake); they sure have lots of planetary links between them!